Here’s a fabulous trifle for a festive occasion! I created it for Christmas this year. It’s a lovely celebration of summer fruit, and is a different take on a traditional trifle with the addition of meringue and passionfruit curd. You need to start with a pretty glass trifle bowl that will adequately display your trifle and its layers. You can really layer it any way you like, but starting with a cake layer and ending with meringue shards and peach slices seems a good way to go. Preheat the oven to very slow – 135 degrees C. Line 2 baking trays with baking paper. Beat egg whites at low speed with an electric mixer until frothy, add cream of tartar and beat on highest speed until peaks hold their shape. Gradually beat in 2 tablespoons of the measured sugar and continue beating for 2-3 minutes. Add all the remaining sugar at once, fold in quickly and lightly with a metal spoon. Using 3/4 of the mixture, spoon or pipe two discs, each about the size of the diameter of your trifle bowl, onto the prepared trays. With the remaining meringue, colour one half yellow, and put both meringue mixtures into two piping bags. Pipe yellow and plain meringues, as many as the mixtures will make, around the edges of the baking trays where you have placed the discs. Bake the discs and meringues for 1 1/2 hours. Leave in oven for a further 1/2 hour or until dry. Place all the ingredients into a saucepan over a medium heat. Stir with a wooden spoon, making sure all the ingredients are amalgamated and the sugar is completely dissolved. Continue to stir until the mixture thickens and coats the back of a spoon. Put aside to cool. Put the egg yolks, cornflour and sugar into a large bowl and stir together with a whisk. Heat the milk and cream together in a pan until hot but not boiling. Gradually whisk into the yolks, then return the mixture to the pan. Stir over a high heat until the mixture just comes to the boil and the custard thickens. Take off the heat, cover and allow to cool. Put the frozen blackberries, sugar and water into a saucepan and gently stir to dissolve the sugar. Bring to boiling point, turn the heat to low and simmer for about 10 minutes or until the fruit is softened and the liquid is reduced. Transfer to a bowl to cool. Line the base of your glass trifle bowl with half the cake, making sure there are no gaps. Liberally sprinkle over half the orange liqueur. Scatter half the piece slices and half the passionfruit pulp over the cake. Spoon the cooled passionfruit curd over the fruit. Now carefully place one of the meringue discs on top of the curd, trimming the edges if it’s too big. Place the rest of the cake pieces on top. If you think there is too much cake, leave some of it out. Sprinkle the cake with the remaining liqueur. Spoon the blackberry compote on top of the cake. Carefully spoon or pour the cooled custard over the trifle, then add the whipped cream. Again, if you think there’s too much custard or too much whipped cream, add a little less. To decorate the trifle, carefully break up the remaining meringue disc into shards big and small (so lots of broken bits don’t matter!). Place the rest of the peach slices and passionfruit pulp around the edge of the trifle and artfully place the meringue shards wherever you like. Then finish by topping the trifle with the individual meringues. This is how I made my trifle – I’m sure there are endless variations to the layering and presentation, so be creative! Posted in Dessert, Meringues, Slow Cooked Food, Sweet Food and tagged berries, Christmas, custard, festive dessert, passionfruit curd, stone fruit. Bookmark the permalink. Stone fruit is just coming into season in Sydney at the start of summer. While peaches and nectarines are still a little firm, apricots are good eating. The traybake is based on a recipe from Gabriel Gate from an SBS program, see here for the original. This is an ultra simple cake, made in a square tin in a shallow layer so that you end up with a traybake rather than a cake. I think it works quite well in this form. I also made the whole cake in food processor, making it really simple. Preheat oven to 170 degrees C fan-forced. Grease and line with baking paper a 24 cm square cake tin. Halve the apricots and remove stones. Cream the butter and caster sugar in the food processor. Add the eggs and process till well mixed. Stir in the honey and then the ground almond and flour. Carefully pour the mixture into the prepared cake tin and arrange the apricot halves on top. Sprinkle with flaked almonds in the spaces between the apricots. Bake the cake in the preheated oven for 30-35 minutes until a skewer inserted into the cake comes out clean. Remove the cake from the oven and allow to cool completely in the tin. When cool, gently lift the whole traybake out of the tin using the baking paper. Brush the top with a little warmed apricot jam to glaze and cut into squares to serve. Posted in Biscuits and Slices, Cakes, Dessert, Savoury Food, Sweet Food and tagged afternoon tea, dessert, stone fruit. Bookmark the permalink. Stone fruit is is still very plentiful although the season is drawing to a close. It’s difficult to believe that we are technically in autumn in Sydney, as the days are balmy and temperatures still very warm. 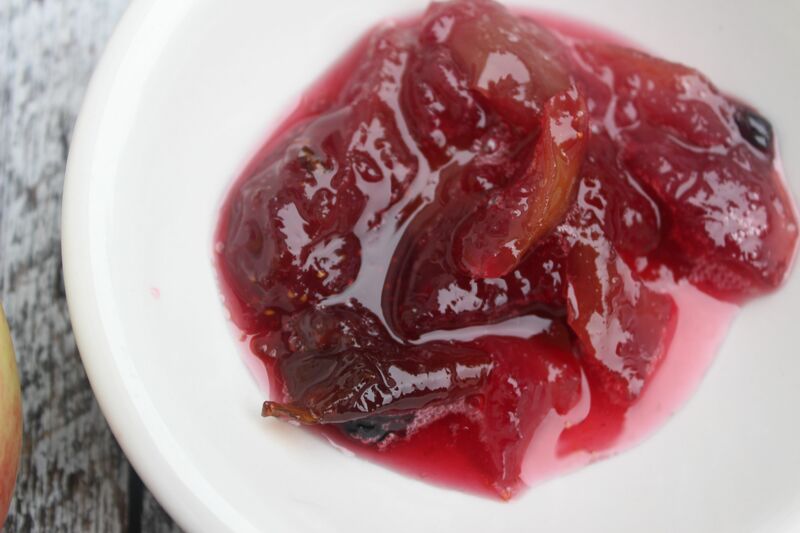 I used my standard plum jam recipe, substituting white nectarines for most of the plums. I added a handful of mixed berries for colour. 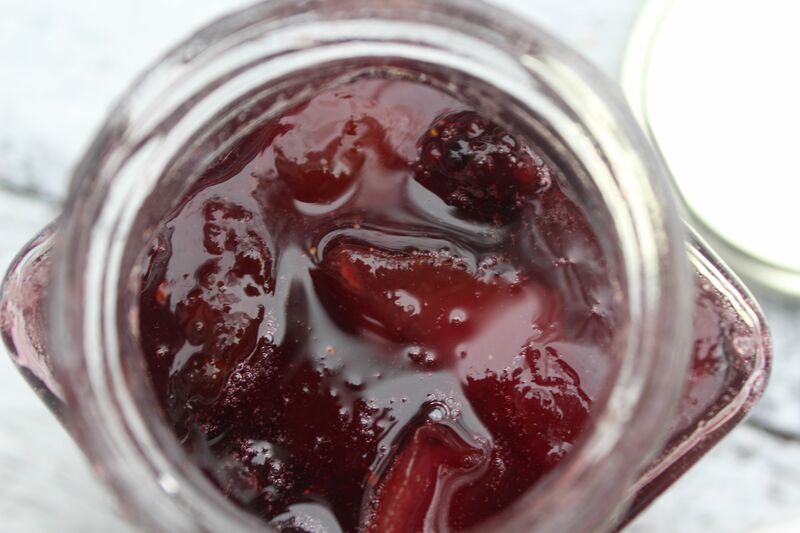 This preserve is more “conserve” than “jam”, as the fruit pieces remain whole in the jelly. Chop the nectarines and plums and remove the stones. Add the frozen berries. Measure the fruit and add sugar equal to 3/4 of the amount. Put the fruit into a preserving pan with the juice of half a lemon plus the lemon skin. Cook slowly for about 25-30 minutes, stirring frequently, until setting point is reached. Test for a set by placing a little jam on a saucer in the freezer for a couple of minutes. The surface should be set and wrinkle when pushed with a finger. If the jam is not set, return the pan to the heat and cook for a further few minutes until setting point is reached. Remove the lemon half and pour the jam into sterilized jars and seal. 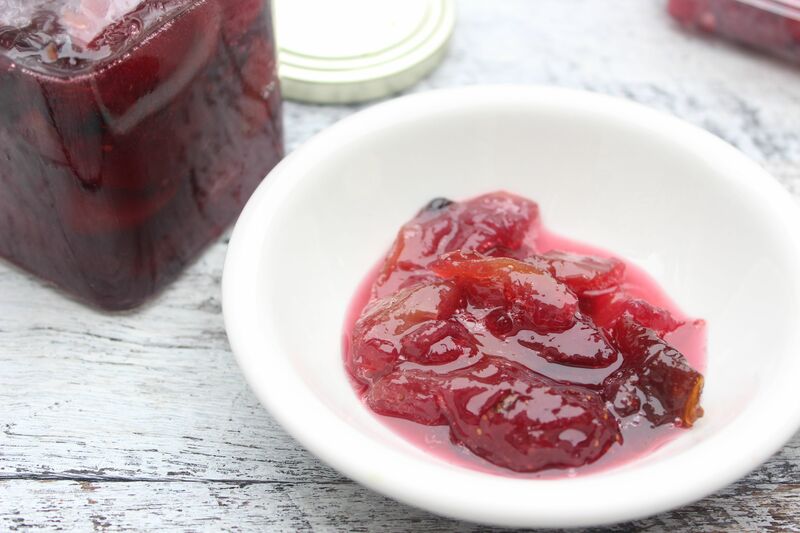 Posted in Jams, Marmalades, Conserves and Chutneys and tagged blood plums, conserve, mixed berries, preserves, stone fruit, white nectarines. Bookmark the permalink.